This is more than just a costume. It bestows upon you the rank of a trained warrior. A knight who can convince people to do his bidding with a single flick of his wrist or move stuff with his mind. No one ever looked bolder walking into a party, lightsaber at your side and using the force to convince all the attendees that you're a real deal Jedi. The force is definitely strong with this costume. 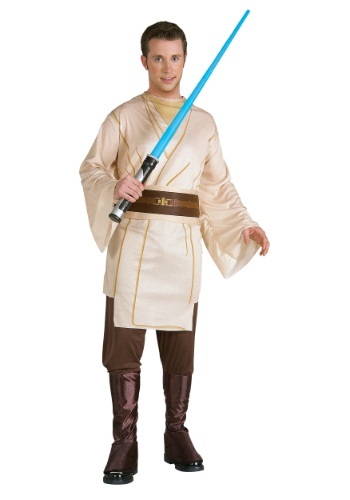 Okay, yes, you won't actually gain mastery of the force when you choose this Jedi costume. But you'll have plenty of time to practice it! And that fact that you'll have an officially licensed Star Wars costume is sure to help the effort, too. This costume is styled after Qui-Gon Jinn, so it works to portray him, but it also works as a standard issue Jedi uniform, too. Since they seem to be all about those tunics! 100 percent polyester, this costume includes the printed character tunic top, along with a printed belt, and brown pants with attached bootcovers. Really, everything you need to get started at the Jedi temple! Be a wise and seasoned master like Qui-Gon, or choose to be an upstart Padawan who's ready to wield a lightsaber. Whatever kind of Star Wars story you create for your party is just fine by us!